Practices using posture, breath, and movement to affect Chi, the intrinsic energy in each of us, go back centuries and have been practiced by millions. “Chi Gong” practices (working with vital energy) include various T'ai Chi forms, massage, acupuncture, and meditations. The basic principles used in T’ai Chi Chih® are believed to have been practiced in India and China as early as the 6th century BCE, though related practices most likely pre-dated even this time period. Some forms of Tai Chi have been practiced in the same way for hundreds of years. 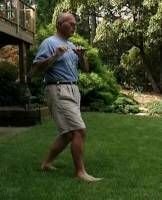 The practice of T’ai Chi Chih® (TCC) as described on this web site originated in 1974 in Albuquerque, NM. T’ai Chi Chih® (TCC) was originated in 1974 by American T'ai Chi Master, Justin Stone, in Albuquerque, New Mexico. Motivated by his work in teaching T'ai Chi Chuan and other disciplines, over a period of several years, Justin Stone refined the movements we use today in T’ai Chi Chih® and introduced them to students in the Albuquerque, NM area. Spreading primarily by word of mouth, TCC is taught today by a network of accredited teachers in US and other countries. Accredited teachers promote and instruct TCC, keeping the practice pure, conducting private lessons or group sessions as they choose. Teachers gather annually for an international conference to share ideas, enjoy the fellowship, draw inspiration from one another, and to work on execution and teaching techniques. Additionally, work shops are held throughout the year to improve execution for teachers and students, and to prepare potential candidates for teacher accreditation sessions. To learn more and to stay abreast of developments in the TCC community, subscribe to "The Vital Force." The TCC Community of teachers is led by Sr. Antonia Cooper, the current Guide of T'ai Chi Chih® (see www.tcccommunity.net and www.taichichih.org). T’ai Chi Chih® is not a martial art, but rather a way to relax and energize the body and mind. The traditional stated purpose of T’ai Chi Chih® is to circulate and balance Chi. Another way to express this purpose is: to use the energy you have today to change your life for the better. Regular practice delivers physical, mental, and, for many, spiritual benefits. TCC appeals to those who appreciate the benefits derived from Chi Gong practice and an expedient way to experience them.